Review: 2012 Mitsubishi Lancer SE: An Impreza fighter or an unknown AWD? 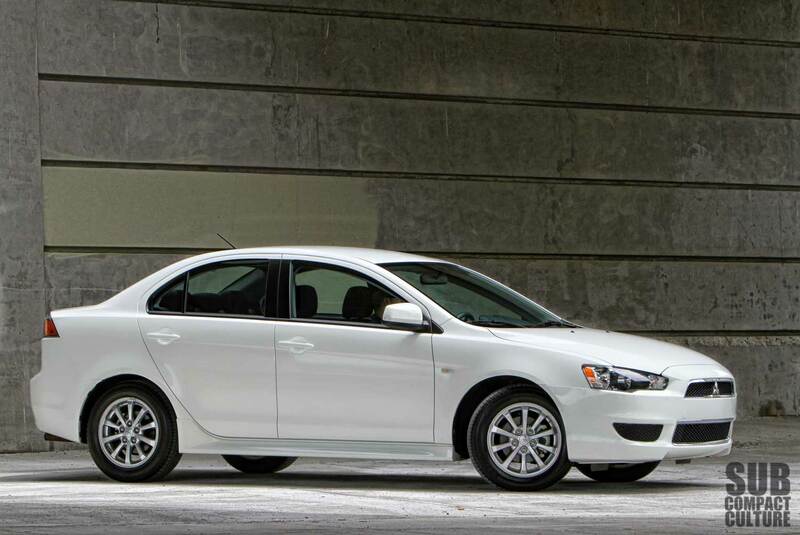 The '12 Lancer SE has a clean, sporting look, especially in "Wicked White." Photo by Curtis Reesor. 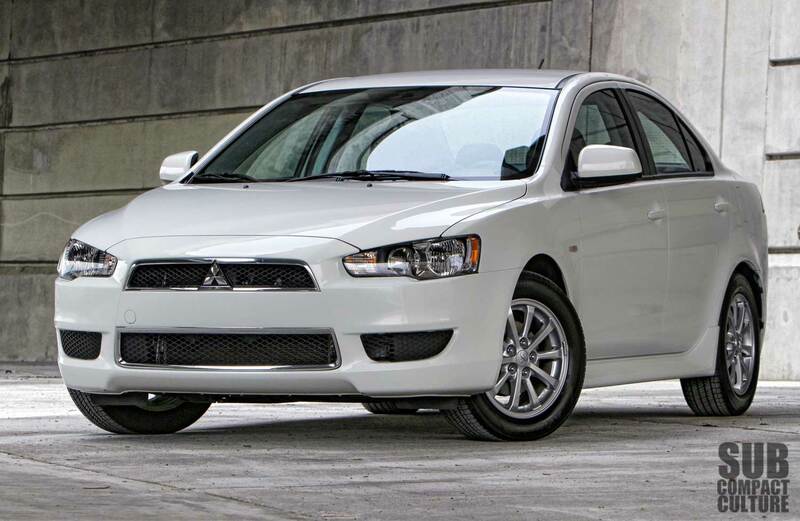 When I think of a Mitsubishi Lancer, I still immediately think of the fire-breathing, all-wheel-drive Lancer EVO. However, there’s more to the Lancer lineup than the EVO. I knew there was a front-wheel-drive non-turbocharged Lancer, but to be honest, I had no idea that Mitsubishi offered an all-wheel drive non-turbo Lancer variant until recently. So when I was told there was a Lancer available for review, I figured it’d be a front-drive model. Instead, it was the Lancer SE, which has AWD, or as Mitsubishi refers to it, AWC—all-wheel control. The Lancer SE is somewhat of an oddity by default, simply because it’s one of only two compact AWD sedans on the market. That other vehicle is Subaru’s ubiquitous Impreza. Surprisingly, no other company offers a car with a trunk and AWD the C-segment. Make no mistake about it, the Lancer SE is not an EVO. It is also far lesser known than its rally-car cousin. But that’s OK—not everyone cares to own an EVO or has the money for one. This is where the Lancer SE comes in. But does it have what it takes to sway buyers from Subaru dealers? I particularly like the Lancer SE's side skirts. I think it's a great looking compact. Photo by Curtis Reesor. At first glance, I still think “EVO,” which is a good thing. However, the Lancer SE’s styling is more like “EVO subdued.” Its side skirts, nice-looking 16” alloy wheels, and overall stance help the car look classy and sporting. It’s understated, has clean, attractive lines, but looks just right. I’d even go as far as saying it’s one of the better looking C-segment cars on the market. One of my few exterior gripes lies at the back of the car: The tailpipe looks cheap. No finisher or anything; just a piece of conduit-like pipe coming off of the muffler. It might be minor, but I couldn’t help but think it looks like they skimped out here. Unfortunately, that same cheapness transcends into parts of the interior. The visors feel flimsy, the climate controls knobs feel loose and cheap; they’re the worst I’ve felt on any new car. Much of the switchgear also has a bargain-basement feel to it. The front seats are comfortable, but there isn’t much side support. The rear seats were on par with other compacts in the segment. 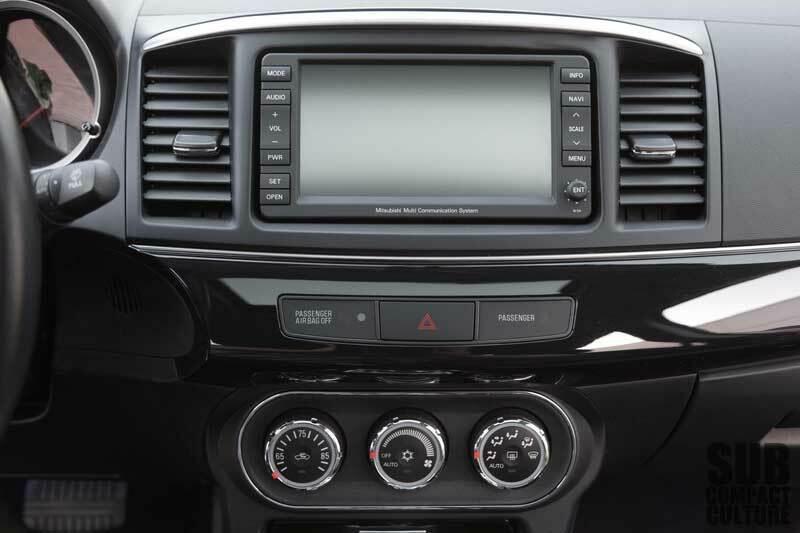 Unfortunately, the nav and infotainment aren't easy to use. The climate controls are made of low-grade materials. Another cockpit gripe was Mitsubishi’s infotainment/navigation system, which it isn’t very user-friendly. But that’s just the start of it. The 140 watt stereo would not get loud enough. I frequently had it all the way up and it still wasn’t loud enough. To top it off, when the volume was turned up, the bass from the four-speaker stereo would rattle the door panels like no new car I’ve ever been in, which I find unacceptable. This would require a trip back to the dealership if it were my vehicle. Some other quirks: The car has all the controls for Bluetooth on the steering wheel, but they don’t work. That costs extra. In fact, on the window sticker, it specifically says “Prewired for Bluetooth (Additional Equipment Required).” Want to connect your phone or MP3 player to listen to your music? Make sure you have a cord with RCA connectors. These are the red and white connectors found on the back of most TVs used to connect audio devices. I don’t know why Mitsubishi would stray from the industry standard 1/8” stereo jack, but they do. Like other non-turbocharged Lancers, the SE model is equipped with the 2.4-liter 168 horsepower MIVEC engine. Featuring variable valve timing and lift, the engine is surprisingly peppy, even when mated to the CVT—the only transmission available. The engine makes a racket under acceleration, but otherwise it’s quite good, especially in the mid-to-upper reaches of the RPM range. I do, of course, wish this model were available with a manual transmission; something the Subaru Impreza does offer. 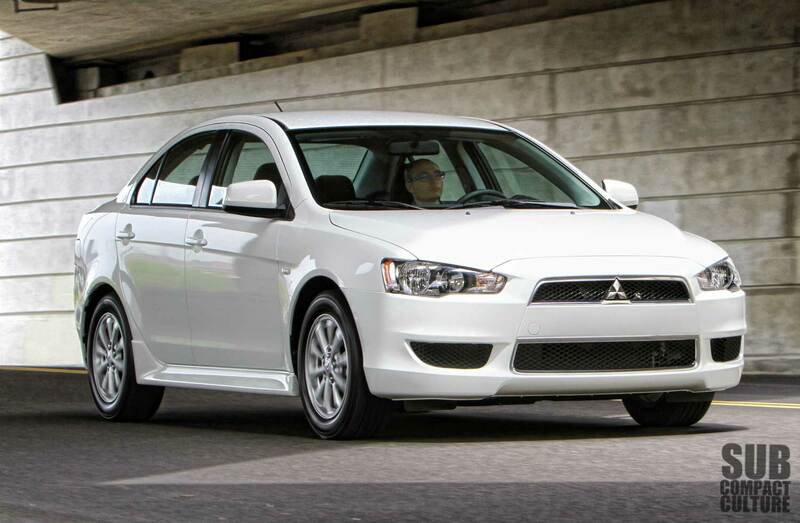 All-wheel drive gives the Lancer SE a sure-footed feel, but it is not particularly sporty. Photo by Curtis Reesor. The Lancer is sure footed thanks to the previously mentioned AWC all-wheel-drive. This is a selectable system that allows the driver to select 2WD, 4WD, and 4WD with lock, which is good for deeper snow, etc. There is plenty of grip from the system in both rain and dry conditions, but despite its sporting intentions, this is not a sports sedan. There is a lot of body lean in the corners, and like so many softly spring vehicles, the ride is decent, but the handling suffers. Because of this, the Lancer is actually better on the highway than it is in the corners, which is something I didn’t expect. Another unexpected thing was the amount of rattles at highway speed. The Lancer SE’s fuel economy is rated at 22 city and 29 highway. I averaged 24 MPG. That didn’t sound too bad until you realize the latest Impeza is rated at 27/36 with a CVT. When compared to the all-new Impreza, the Lancer feels dated and not as solid as the Subaru, which is too bad, since it’s the only other option in the compact AWD sedan market. Sadly, a lack of marketing only makes this car more invisible against the Subaru. The muffler/tailpipe on this car as looks cheap. Otherwise, the back end looks good. Photo by Curtis Reesor. Despite the negatives, the car is reasonably affordable. This Wicked White test model stickered at $23,285, which includes $2,295 worth of optional navigation and destination. Take away the nav and you’ve got $20,990—even better. This is right at the same level as the Subaru Impreza 2.0i Premium. But the Subie comes with standard Bluetooth and a six-speaker stereo, plus it feels more solid and engaging. 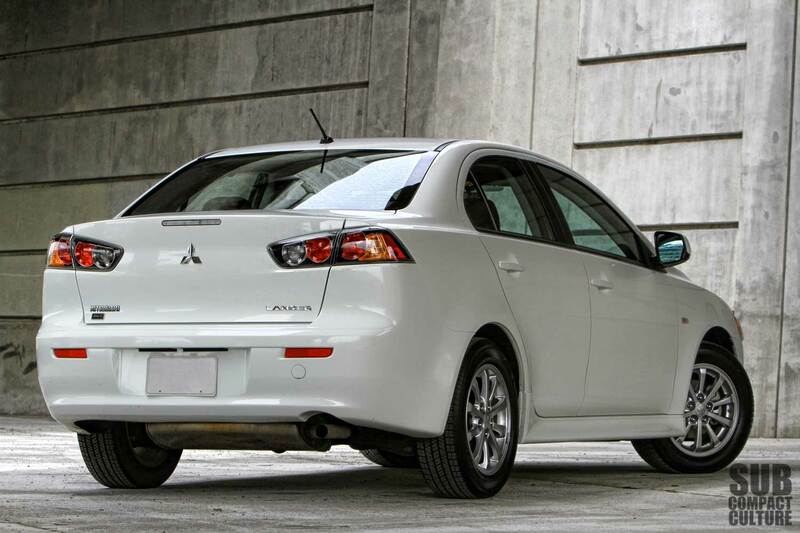 The Lancer SE looks good, has all-wheel drive, and is priced competitively. And although I prefer the looks of the Lancer to the Impreza sedan, the Lancer has some shortcomings that are hard to overlook. Your review about Mitsubishi Lancer is informative. It is really great work. Thanks for sharing your experience with us. People love Mitsubishi and customer are getting many facility from Mitsubishi Companies. I have bought Mitsubishi pajero . I really enjoy to drive this car.